Description: Collectible Colt Python .357 Mag./.38 Spec. 4" barrel 6-shot single/double action I-frame revolver. 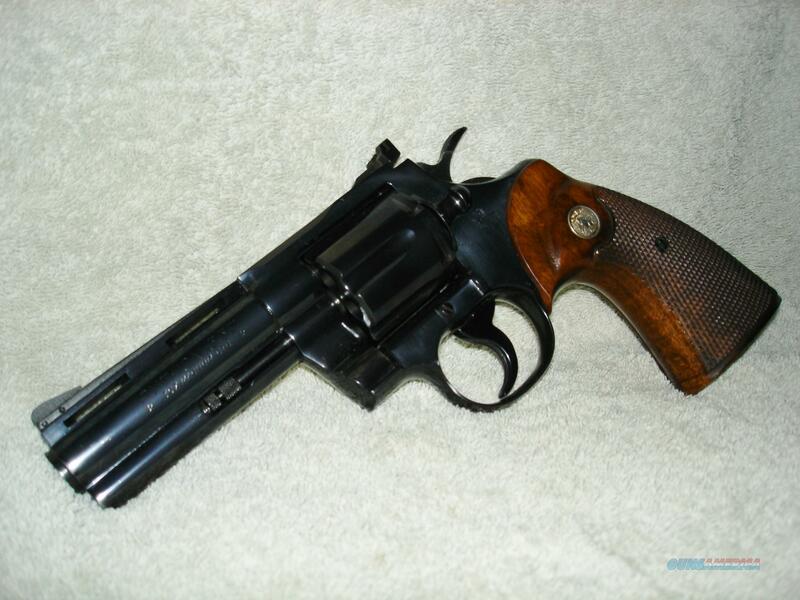 Serial number: 51391; per Colt's online serial number/year of manufacture records, this gun was produced in 1966. Based upon no indications of firing/wear, there are reasons to believe that it's unfired, except during factory test firing. Gun only; no factory box/papers. High-polish steel surfaces, deep Royal Blue finish, serrated ramp front sight; rear sight has square notch blade adjustable for windage/elevation, grooved trigger, top and rear hammer surfaces are blued, as are top and underside of the checkered wide hammer spur...hammer sides are "in the white" (unblued), full-barrel length underlug shrouds/protects the knurled-end ejector rod (which has no signs of usage/wear), factory-original checkered (diamonds not worn) walnut grip panels with inlaid gold toned-finish Rampant Colt medallions; however, possibly due to long-term storage in a gun case and, perhaps, coverage with a liquid preservative, the left medallion has much of the gold finish absent and the right medallion has most of the gold finish remaining. Stamped barrel inscriptions: Left side - top line: PYTHON .357; bottom line: * .357 MAGNUM CTG. *; Right side - one line: COLT'S PTFA MFG. CO. HARTFORD CT. U.S.A. Rampant Colt logo stamped on left side of frame, below rear of cylinder latch knob. Cylinder has very faint, nearly invisible turn ring (most likely from factory test-firing), hammer shows no signs of usage (e.g., no scuff marks on sides or worn bluing on hammer face), trigger shows no wear marks on the sides, no cylinder latch movement wear/scuff marks on frame, no wear signs on the cylinder crane, no wear or blemish of bluing on the recoil shield, including around the firing pin flash hole which occurs when firing causes rearward cartridge head impacts against the shield. There are a couple of very small spots of extremely shallow rust pits (rust has been removed) on the right side of the frame behind the external upper rear edge of the recoil shield. Bore, cylinder chambers, and front face of cylinder are in as-new mint conditions. Grooved grip frame backstrap. Matte, non-glare finish on top of frame and ventilated rib. The reason for the no-return policy is because the gun is as honestly-described and displayed in the ad, to the best of my ability. Payment; Shipping; FFL: Usually ship within 1-2 business days after payment posts to my bank acct. I will need a copy of your dealer's Federal Firearms License (FFL) emailed to me or included with your mailed payment because I will need to provide the copy to my FFL dealer for shipping to your dealer for transfer to you. If your dealer will not provide his FFL copy to you or me, he can fax or email it to my dealer, who will provide his FFL copy to your dealer. My FFL dealer will charge me $60 for transfer paperwork, record keeping, gun packaging, and shipping, plus a shipping insurance amount of approximately $50-60, for a total of about $110-120. NO TRADES, RETURNS, REFUNDS, FOREIGN SALES, OR SALES TO U.S. PROHIBITED AREAS. Eligibility of passage of federal background check after gun delivery to receiving dealer is the responsibility of the buyer and if the background check is failed, the buyer is prohibited from taking possession of the gun. It will then be the buyer's responsibility to have the gun purchased or sold by an FFL dealer to a legal buyer. It is the prospective buyer's responsibility to know whether the sale is prohibited in her/his area of residence. If the gun is unknowingly and mistakenly shipped to a receiving dealer in an area which prohibits its sale, it will be the buyer's responsibility to not take possession of the gun and to have her/his dealer sell it to a non-prohibited dealer/non-prohibited person. Questions re: purchase eligibility, contact police officials and/or the BATFE, PRE-SALE.